0 A Yellow Outfit Just For You! 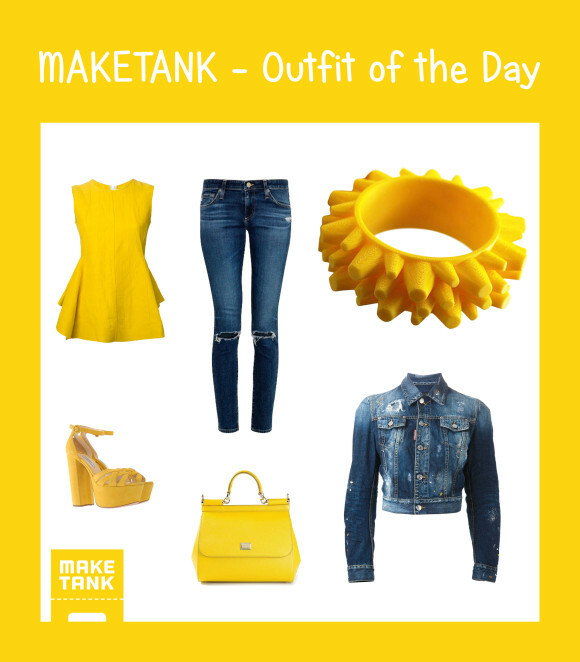 A yellow outfit just for you! Studies in positive psychology and embodied psychology have shown that the way you dress can have a drastic effect on how you feel. This idea has become known as enclothed cognition: a term coined by cognitive scientists of Northwestern University, enclothed cognition means that there is a correlation between quality and symbolism of attire and the psychological state as well as performance of its wearer. Essentially the concept can be summed up in the phrase “look good, feel good!” Today, here is an outfit that will take your attire to the next level and hopefully give you the confidence, energy, and enthusiasm to take the day by storm! First, "Marni", a peplum top in a washed-cloque fabric with an exposed back zipper, offers an edgy but elegant way to don one of this season’s go-to colors: yellow! This product is originally made in Italy and is beautifully crafted to flatter any body type. Take advantage of the sale going on right now and save 30% on your purchase of the top at £434.00. You will look amazing in the flattering lines of this fantastic fabric and feel great wearing it too! Next, shimmy into the trendy “Alexa Chung for AG” skinny jeans. These fitted mid-rise blue jeans have equality that speaks to the coolness of their wearer: yes, that’s you! The fitted material is loosely related to leggings and features a stylish fray and rip at both of the knees. Then comes the fun part: accessorizing!!! Start by sliding the “Stratosfero G” (€75.00) onto your wrist, the newest and neatest type of product out there. 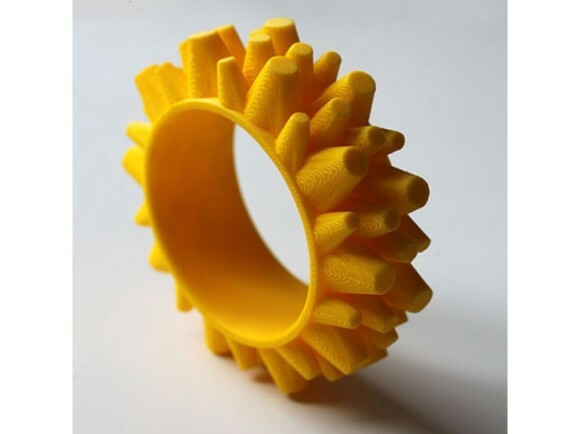 This bracelet is 3D printed and made with yellow ABS plastic and FDM technology. Not only does it represent the paramount of innovative technologies, but it also exudes a fun and exciting personality. The interesting layered texture and statement size of the piece conveys a message about its wearer: this person is brave, fun, and confident. Go head to toe! Next, slip into the bold and elegant “Prada – Sandali”. These bright yellow platform sandals with straps near the toes can take your outfit to the next level. These shoes scream summer: it’ll look like you’re walking on sunshine all day when you don these stylish sandals! Every girl needs the perfect bag to compliment her outfit and this is just the right one for your day in yellow: “‘Sicily’ Tote” by Dolce & Gabbana. This 100% yellow leather bag is as dynamic as you are today! It has a fold-over top with a magnetic closure and features an internal compact mirror; the top handle can be detached and there is a shoulder strap available for adjusting depending on how you personally want to rock this accessory! To complete your outfit, turn to your chic “Dsquared2” cropped jean jacket. This staple item will wrap your outfit up and give it an even more glamorous air. Once you have this item, you are ready to walk out the door in style! This hip and fashionable look will make you feel as amazing on the inside as you look on the outside, wearing some of the coolest pieces you can find! Looking for more outfit ideas? Stay tuned by liking MakeTank on Facebook!